When you plan to find a king size bed of the current style or trend; there are various contemporary king beds with different material and style including wingback and platform beds. Graceful and stylish Fares Upholstered Bed is an updated version of the classic wing style bed with its high wingback headboard. The handsomely fashioned headboard features diamond shaped button tufting and luscious padding for comfort while resting against the headboard when you enjoy your morning coffee or bed tea. Bed Type: Panel bed with wingback headboard. Feet of the bed and center legs are made from rubber wood solids. Bed frame is fully upholstered with 100% polyester fabric. Matching button tufting on thick foam padded headboard. Bed includes headboard, footboard and bed rails. Requires a box spring (not included). Additional center support legs for optimum stability. Manufacturer offers 1 year product warranty against defects. Handcrafted in USA with solid pine, the gorgeous Herb Upholstered Panel Bed is a must have in a modern style bedroom. The Herb Upholstered Panel Bed unites elegance and luxury with its diamond tufted headboard. The stunning headboard is upholstered in plush velvet and the wings are finished with a gleaming double row nail button trim which adds instant panache to your modern bedroom décor. Herb Upholstered Panel Bed Collection. Solid Wood Construction; manufactured from solid pine. Headboard is also finished in the back for a complete fine look. Bed frame is fully upholstered in plush velvet. Velvet fabric is flame retardant. Polyurethane and polyester padding for comfort. Beautifully tufted with nail trim detailing on headboard. Available in two distinct colors: Dove and Mondo. Box spring is required but not included. Low profile box spring is would be great. Available in these sizes:California king size, king size, queen size and full size. Full and queen size beds come with 1 extra support rail with additional center support legs for optimum stability. California King and King bed come with 2 additional support rails. 1 Year Manufacturer Warranty, excluding fabric. Clean, charismatic and contemporary style of Blanke Upholstered Platform Bed gives it a picture perfect look. The classy yet stylish Bed features a Malaysian-made bed frame with inner frame of hardwood and plywood that are lusciously padded with foam and upholstered in soft faux leather. Studded with faux crystals, the scallop-cornered headboard with matching upholstered bed rails and low footboard creates a trendy look. Non-marking silver metal legs complete the look. This platform bed includes 3-4 inches apart wooden slats and 3 center support legs and does not require a box spring. Product care: Easy to maintain Blanke Upholstered Platform Bed can be wiped clean with a damp cloth when needed. Blanke Upholstered Platform Bed Collection. Hardwood construction with plywood inner frame. Available in two distinct colors: Black and White. Scallop-cornered headboard is beautifully tufted with faux crystals. Includes headboard, bed rails and engineered wood slats. Slat support system and 3 center support legs ensure maximum endurance and stability. Economical choice as this bed does not require box spring. Maximum weight capacity for queen size bed is 400 lbs. Other Bottom of Side Rail to Floor: 6"
House of Hampton Upholstered Platform Bed features an elegant design with modern sweeping lines and generously padded headboard that is upholstered in bi-cast leather. The rolled headboard of this platform bed is tufted with matching buttons to create an atmosphere of royalty in your master bedroom or guest room. The Bed comes complete with European slat kit and center support legs to offer endurance and stability for many years to come. Product care: Use a damp cloth to spot clean. House of Hampton Bed Collection. Manufactured from hardwood; solid wood construction. Choose from two distinct colors: Black or White. Hardware material is steel with black finish. Bed frame is upholstered with bicast leather. Upholstered headboard, footboard and side rails included. Rolled and button tufted headboard. Economical choice; does not require box spring. Bed comes complete with European slat kit. King size bed comes with 14 euro slats. 2 center support legs ensure additional support and stability. Available in 3 different sizes: Eastern king size, California king size and queen size full size. Maximum weight capacity is 450 lbs. CARB Compliant to ensure indoor air sanitation. Beautify your bedroom with gracefully fashioned Arno Upholstered Panel Bed. This elegant black bed features a wingback style headboard with faux crystal tufting and silver nailhead trim detailing which adds value to the overall look of the bed. The headboard is generously padded with foam so that you can lean against it comfortably while reading your favorite novel. This gorgeous Savoy Upholstered Wingback Bed is made from eco-friendly materials and components and is perfectly safe for your lovely family. Arno Upholstered Panel Bed Collection. Select your favorite from 3 distinct colors: Black, Cream Linen or Grey. Headboard, footboard, bed rails and slats come with it. 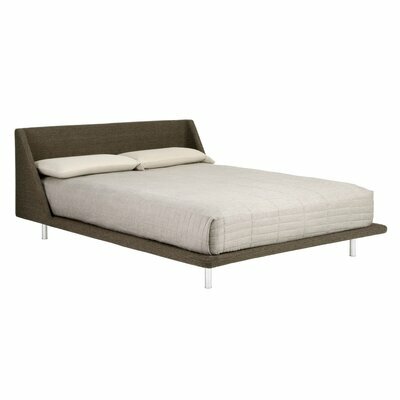 Bed frame is upholstered with synthetic leather. 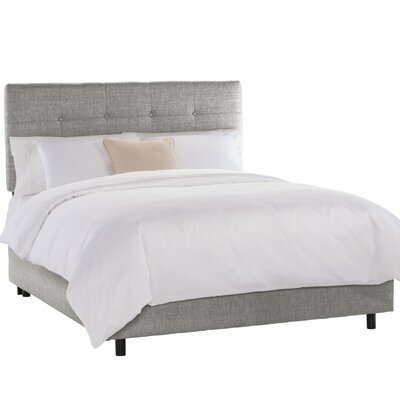 Button tufted with silver nailhead trim details (Black and Grey beds). Bronze nailhead trim with matching button tufting (Cream linen bed). 3 slats for supporting your mattress. Requires box spring (not included with the bed). Center support legs offer additional stability and endurance. Easy to assemble with the help of Allen key. CARB compliant to maintain healthy indoor air quality. Designed to accommodate standard box spring and mattress. Manufacturer provides 1 year product warranty. The contemporary styled Voight Upholstered Platform Bed will change the overall appearance of your bedroom décor with its elegant yet stylish design. This aesthetically charming platform bed features an upholstered and foam filled headboard with nailhead trim details. The stunning beige colored bed is upholstered in an easy to maintain polyester fabric. Four bed slats are supported with screws to provide support to the mattress for safe and sound sleep. Voight Upholstered Platform Bed Collection. Includes upholstered headboard, footboard and bolt on side rails. Foam filled headboard upholstered with polyester and polyester blend fabric. Nailhead trim details on headboard. 4 screw in bed slats included with 4 center support legs for endurance and stability. Easily accommodates sleep number adjustable beds. Mattress sits 5″ above the floor. Manufacturer provides 10 years warranty on bed frame and only1 year warranty on fabric and foam. Add an appealing charm with a dash of sophisticated elegance to your modern bedroom décor with Wildon Home ®Upholstered Arch Wingback Bed. This platform bed features an upholstered wingback headboard with matching button tufting and deep brown finish that adds value to the overall look of the bed. Manufactured from sturdy wood, this bed ensures great strength and durability to endure wear and tear of many years to come. The Wildon Home ®Upholstered Arch Wingback Bed requires assembly and is available in 2 different sizes for you to choose the one that suits your requirement. Upholstered Arch Wingback Bed Collection by Wildon Home ®. Bed frame is upholstered with textured fabric. Color of fabric: Deep Brown. Includes headboard and footboard with bed rails. No curvature in the headboard and it lays flat against the wall. Low profile box spring recommended (not included). Enhance the elegance of your master bedroom with this graceful Skyline Furniture Groupie Upholstered Panel Bed. Constructed in USA from pine wood, this bed is sturdy and robust. The Groupie Upholstered Panel Bed features thickly padded foam filledhead board which is upholstered in beautifully textured handmade basket-woven fabric. This panel bed is CARB complaint and maintains indoor air quality. The bed stays safe while in transit as it is ISTA 3A certified. With maximum weight limit of 500 lbs, this upholstered panel bed is available in 3 different colors and 5 different sizes to offer you wide variety to choose from. Manufactured from pine wood in USA. Black metal finish on hardware. Available in 3 unique colors: Gunmetal, Pewter and Praline. Upholstered with handmade basket-woven fabric. Button tufted headboard padded generously with foam. Slat support system ensures maximum support to the mattress. Center support legs provide extra support with endurance. Available in 5 sizes: California king size, king size, queen size, twin size and full size. The LifeStyle Solutions Magnolia Platform Bed adds elegance with style to your modern bedroom setting with its enchanting charm. Solid wood construction renders durability and sturdiness to this platform bed. 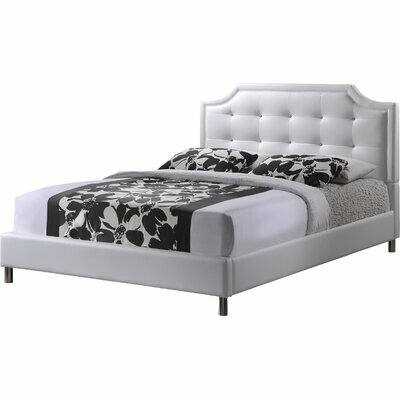 The Magnolia Platform Bed features a generously padded headboard with silver nailhead trim. 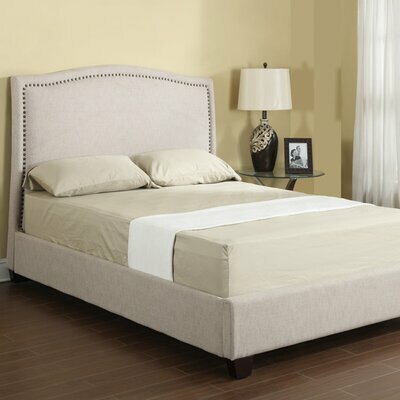 The bed frame is upholstered in microfiber suede fabric and features an alluring crème color. The handsomely fashioned upholstered platform bed will prove to be an excellent addition in any bedroom décor. Product care: Wipe clean with a damp cloth to keep it dust free. Manufactured in Malaysia from solid wood. Bed upholstered in microfiber suede fabric. 13 slats for supporting mattress. Available in multiple sizes (California king size, king size and queen size). Make your dream bedroom a reality with the chic and futuristic look of Blu Dot Nook Platform Bed. Furnished with a slick frame and gorgeously curved headboard, this stunning platform bedroom is an ideal choice to enhance the beauty of your modern bedroom décor. Both the bed frame and headboard is gracefully adorned with vibrant colored upholstery that reflects peppiness. You can easily remove the upholstery fabric for washing. The simple and trendy Blu Dot Nook Platform Bed features a pre-cambered slat system that supports your mattress to always stay in place and does not slip which ensures a safe and sound sleeping experience. Slim and slick steel frame. Available in 6 trendy finishes/fabric colors: Aqua, Chalk, Dark Roast, Guacamole, Gunmetal and Taupe. Bed frame and padded headboard is fully upholstered with fabric. Fabric is easily removable for wash.
Aqua fabric material: 60% Wool / 40% Rayon. Chalk/Dark Roast fabric material: 70% Acrylic / 30% Wool. Guacamole fabric material: 80% Acrylic / 20% Wool. Gun Metal/Taupe fabric material: 100% Polyester upholstery. Pre-cambered slat system provides support to the mattress. There is no need of the box spring. Available in 4 sizes (twin size, king size, queen size and full size).